ELECTRICITY: ELECTRICAL CIRCUIT: THREE WAY SWITCHES: simplified animation of the movement of electrons (the opposite of conventional current) in DC three way switch arrangement. THREE WAY SWITCHES are so called because they have three connected points (terminals) inside them. They can exist in two states but in both states they are connected to a wire, whereas in a regular on-off switch only two points (terminals) are connectected to a wire. The third point has no connection and is the off position. 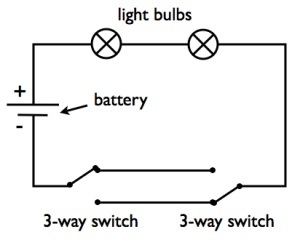 If two 3-way switches are arranged as illustrated then the lights can be turned on or off at either end of the circuit. As you can see, the current will travel through either the upper or the lower of the two wires that connect the two switches. This animation uses a regular single cell to supply current. In a real situation (in a house) it would be AC (alternating current). The advantage of this arrangement of switches is suggested by the little flight of stairs that appears in the animation: you come home at night and switch on the hall and stairway light to see your way to bed. Once upstairs you can switch the lights off again from the upper landing. It would be annoying, inconvenient, dangerous and pointless if you had to go down the stairs again to switch the lights off! You'd have to climb the stairs again in the dark! CIRCUIT DIAGRAM: at left shows the layout of the above animation in one of the off positions. You can see that the circuit is open and so no current can flow. If the positions of both switches were reversed then it would still be an open circuit. There are also two ways for the circuit to be closed: both switches in the up position or both switches in the down position.